I am seriously getting into macro photography! 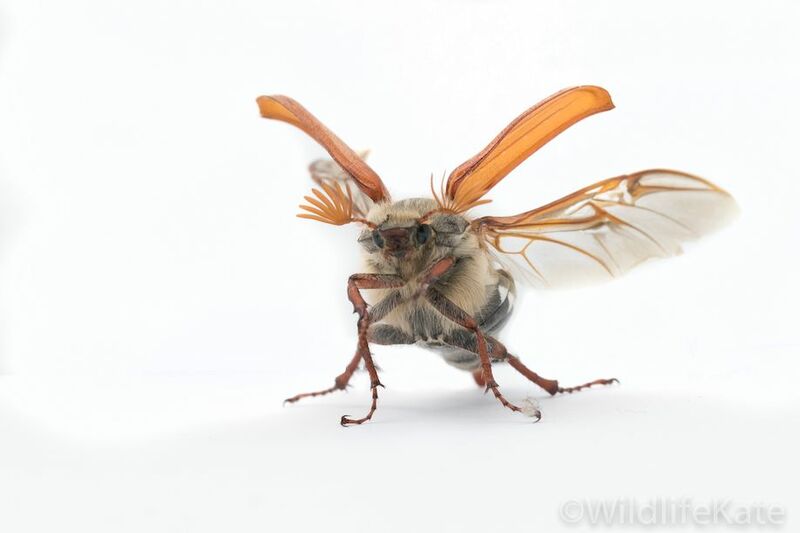 I love how a macro photograph can reveal the beauty of an insect that you simply cannot appreciate with the naked eye. Be it feathered antennae, striations on a carapace or delicate hairs on an abdomen, I can end up spending hours marveling at the details that are captured in my macro images. Macro photography can be an expensive business, but after saving up and purchasing my Canon 100mm 2.8 lens, there was not a lot left to purchase a macro studio and lighting. I wanted something that I could easily carry around, set up in the field and use in a variety of situations. I already had a flashgun and a remote, meaning I could trigger the flash remotely from my DSLR. I purchased a pack of A3 white foamboard sheets for just a few pounds. Using masking tape as a hinge, I created a simple backdrop, with foldable sides. I then used another sheet as a roof that I could bounce the light off of. Another sheet formed the base and I found using a sheet of A4 white paper allowed me to move a subject around inside my ‘studio’ without touching it and upsetting it. I could also turn it around to photograph it by turning the paper. I experimented with the flash and found the manual settings that worked best with my DSLR. These vary depending on the ambient light, but it was relatively easy to get the flash to fire, bounce the light off the ceiling and light the scene correctly. 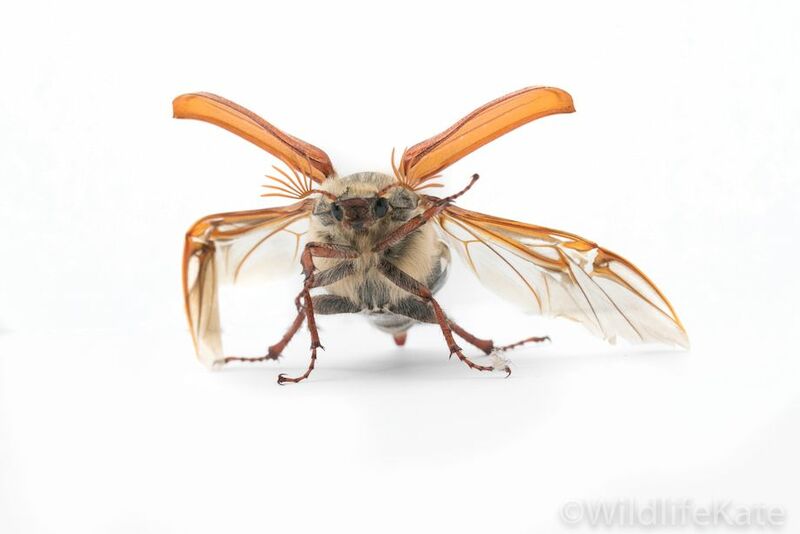 I have used this set up to photograph moths, but when a Cockchafer beetle appeared in my garden, I could not wait to see if I could photograph it. 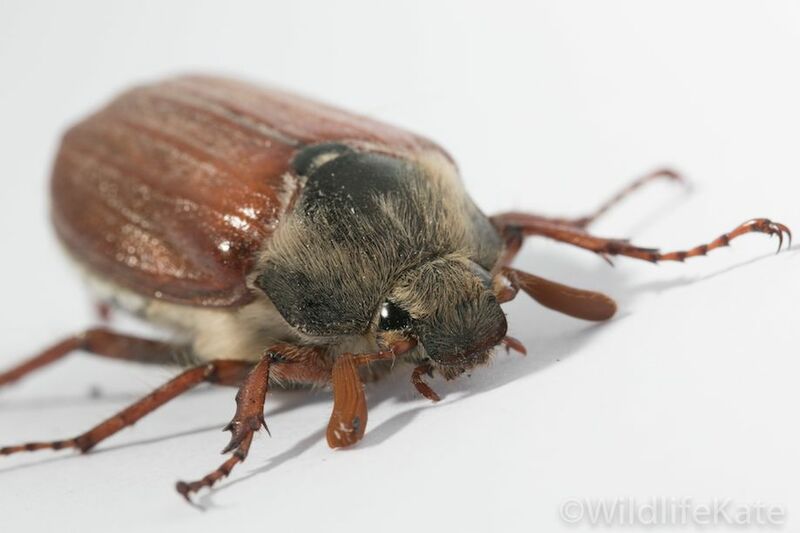 Cockchafer Beetles, also known as May Bugs, usually appear late April, early May. 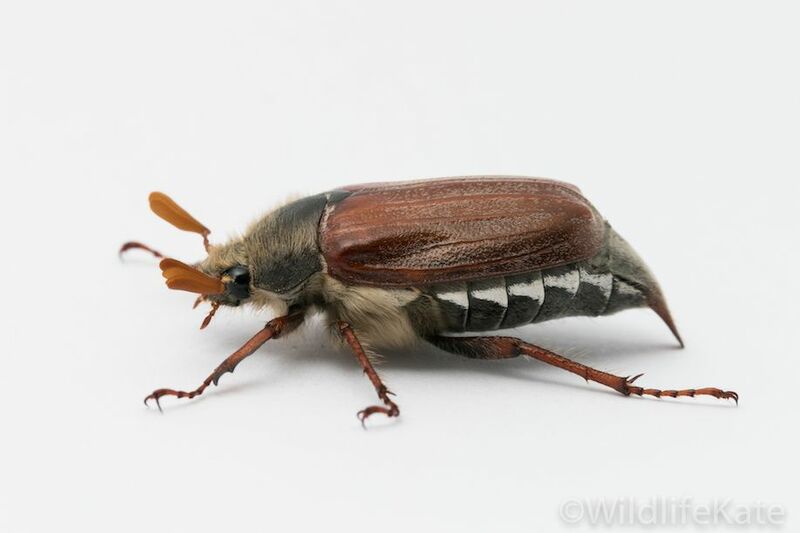 With a late Spring, this beetle appeared in June in my garden. 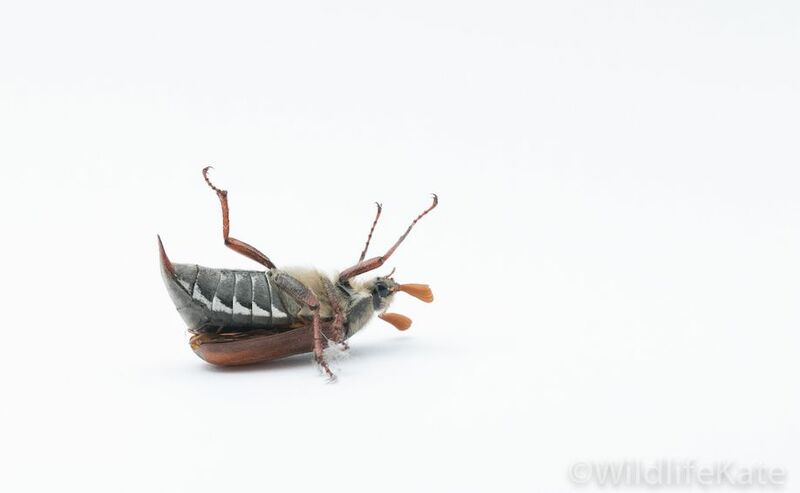 Life for a Cockchafer beetle begins as an egg laid around June – July, hatching into a white grub which lives underground. Grubs can spend 3 years underground until they pupate. 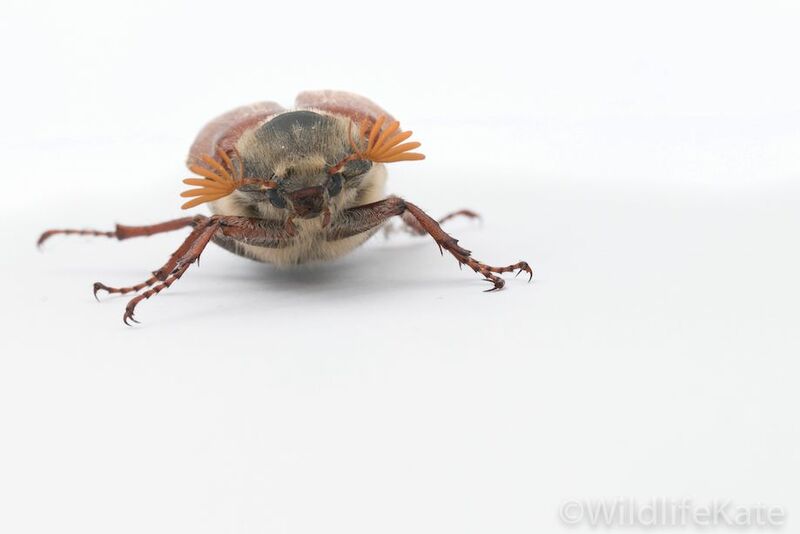 As grubs they eat roots and tubers until they reach around 4cm. 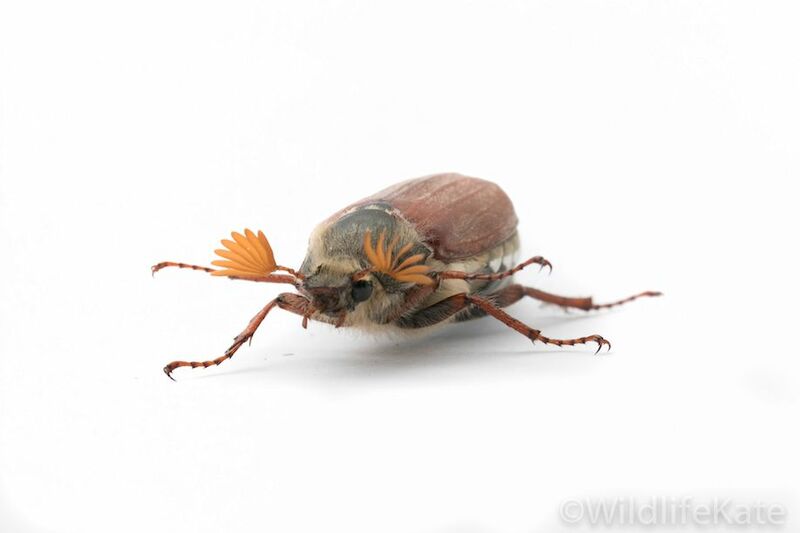 This is the point when they pupate, emerging as an adult beetle (or imago) in the spring. They then live as adults for just six weeks during which time the female can lay as many as 80 eggs. 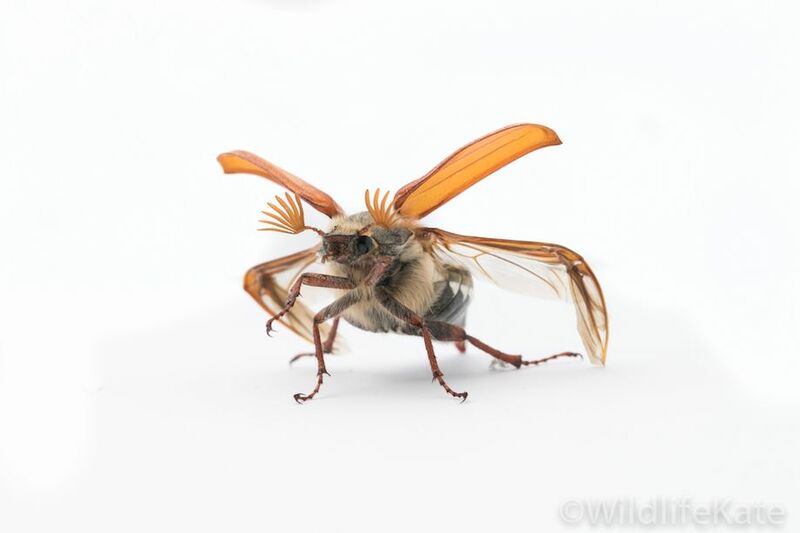 These large beetles fly in a rather ungainly way and often crash into windows. There seems to be a design fault in their bodies as well, as they frequently land upside-down and find it hard to upturn themselves. I got quite a few shots as he tried to trundle out of my studio but I wanted to capture the moment that he unfurled his wings from inside his wing cases and launched into the air…. 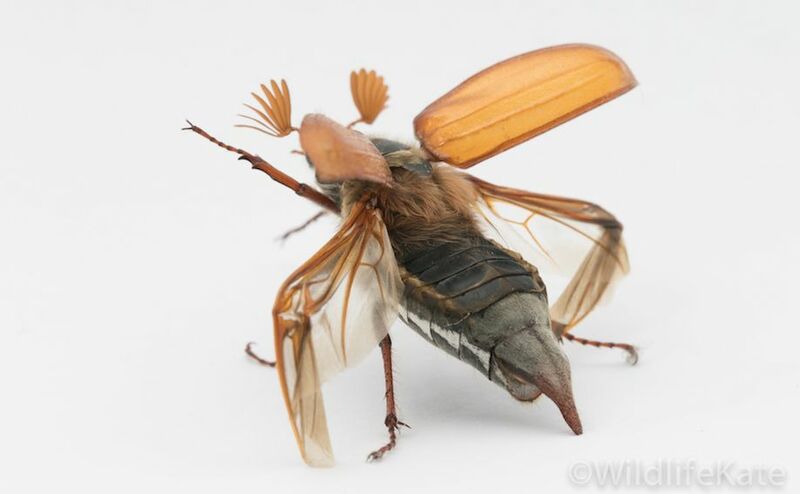 these wings are a wonderful example of nature’s engineering…. but it was very difficult to capture that moment in one shot, as I needed the flash to fire to illuminate the subject. I had to time it correctly, as his wings opening and his attempts to take off, happened in just a second. It took me several attempts to capture this incredible moment… a moment that you simply cannot see with the naked eye. 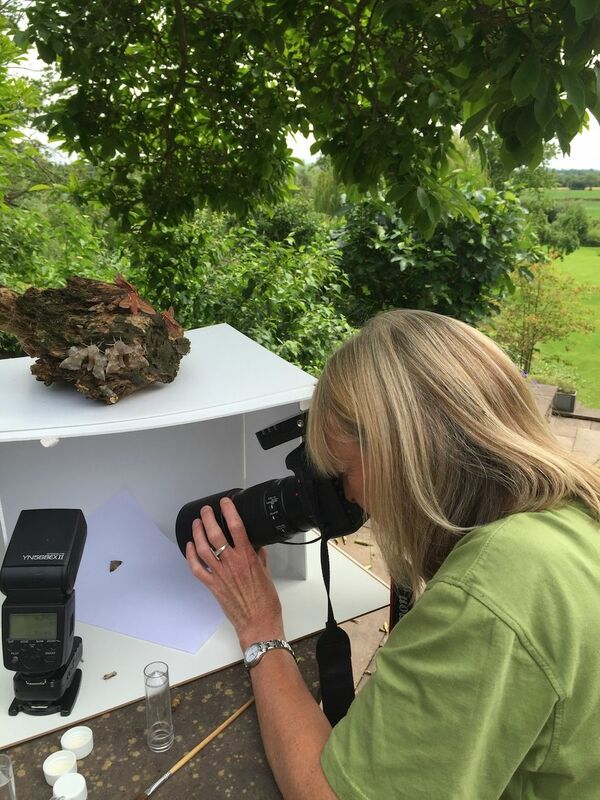 My macro studio comes everywhere with me, as you never know when an opportunity may arise… who knows what I will be able to capture next in my little homemade studio!